My husband, Dale, and I, – and no doubt countless others, – are farming to a standard far in excess of any available certification and yet we have no way of communicating that to consumers, nor we do we get recognition for it – and that’s a scary thought. Enter stage left Whole Health Agriculture with a definition of holistic farming as it should be. They got my attention, and – happily – I got theirs, so you will be hearing from me regularly via blogs, articles and videos etc. We moved here to the Peak District while I was still on maternity leave from my much loved job as Conservation and Education officer at Sheepdrove Organic Farm in Berkshire. There I ran school and educational visits, teaching about organic and holistic farming, food provenance, and the importance of working hand in hand with nature to create wholesome food. For two years prior to this I worked for the Sheepdrove Trust on campaign projects about genetic modification, which also taught me a lot about food chains, provenance and trust (or lack of) in the food industry. While our move up to the Peaks was brilliant for my hubby, – a career move from farm foreman to farm manager, – for me, leaving behind friends, an area and a job I loved, and now stuck at home with a baby, staring out of the window at the driving rain (it does that a lot here!) – it was a wake-up call. 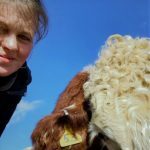 The job opportunities for a woman coming off maternity leave with a background in holistic farm education and conservation are like rocking horse poo – rare at best! And so, when I was invited to join the Whole Health Agriculture community, it was a no-brainer on many levels. We weren’t always ‘hand-knitted yogurts’ as my mother calls us! My husband came late to the farming party; although I have farmers in my family, Dale has an urban background, qualifying in motor mechanics before going on to run catering establishments. Not exactly a rural grounding. But when we got together we decided that we wanted a change, so Dale scraped together bits of dairy experience, using my farming friends to get a foot in the door and after what seemed like 1000 job applications, a contact of a friend (always the way) agreed to take him on as an apprentice- and the rest is history. Dale’s path was probably set by the three elderly brothers who took him on. Each brother had a different approach, but the eldest was the most influential, using cues from nature to determine when to apply slurry, how to judge what and how much food each cow needed, and avoiding metabolic, hormonal and lameness problems by basically letting cows be cows. For us, it was a natural progression into organic farming, but the farm we ended up on next was only into organics for the economic safety net it gave the business. They flouted rules and bent the standards to fit their conventional model and we only stuck it out for 8 months. I had a theory that their repeated TB breakdowns were linked to their poor way of treating the land and the animals in their ‘care’. We’d got the holistic/organic bug by now, though, and our next move, to one of the biggest organic mixed farms in the country, Sheepdrove, was a no brainer. This was much closer to how we imagined organic farming to be – high welfare, wildlife and habitat focused, zero input and we loved it. It still had its issues but we felt we were on the right path. My job of Conservation and Education Officer dovetailed brilliantly with Dale’s role as farm foreman. Conservation measures were upheld and improved, probably because I became a banshee if I thought my bumblebee transects or pockets of Devil’s Bit Scabious were about to be jeopardised by marauding cows or over-enthusiastic hay making! With charitable funding I also managed to get on-farm surveys and research carried out by some of the country’s leading experts in insects, barn owls, harvest mice, bees, fungi, worms and birds, and their findings cemented my belief that farming both holistically and profitably IS possible. 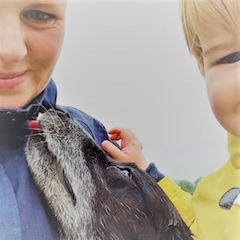 After five years at Sheepdrove, and with a new baby, our little family left for a soggy organic beef farm in the Peak District; in sole charge of it this time and determined to do things the way we feel they should be done. However, we are still being hampered by restrictive rules and a lack of cohesive and common-sense approaches to regulating farms and/or supporting them. This farm has been organic for over 30 years and fully under Higher Level Stewardship for the last ten. There is little cohesion between the two policies. 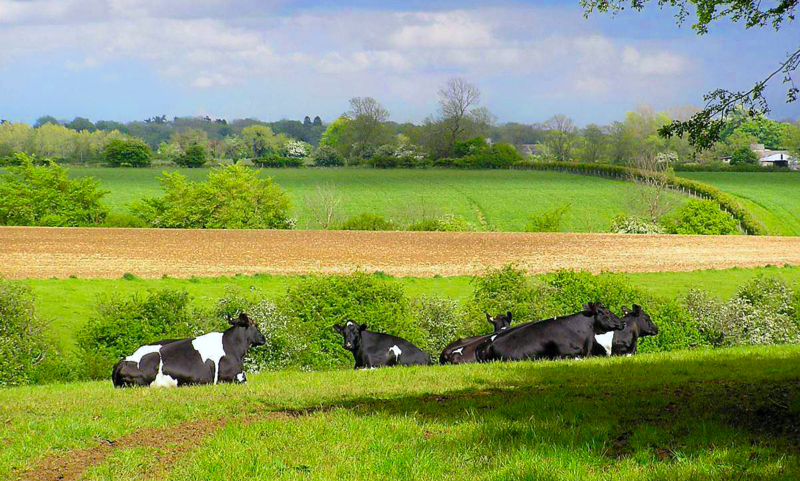 Being organic and under HLS should be the holy grail for how farms should be managed and funded but there are holes in the regulation, or the rules for HLS are so restrictive that, actually, biodiversity and welfare suffers. My husband and I have simple objectives, honed from our varied experience on very different farms. Firstly, the importance of welfare and behaviour; the two are inextricably linked. If your approach to farming livestock is guided by the behaviour of the very animals in your care, their welfare should be taken care of. An understanding of herd interactions and the power of observation should not be underestimated. Secondly, improving biodiversity and pasture health. We don’t use any external inputs and are keen to learn as much as we can about the diversity of grasses and herbs and the benefits they can bring to soil and livestock health. The biggest change we have made to the plant and pasture health of the farm, and consequently the cattle health has been the use of rotational grazing. (More on this later!) Our biodiversity is improving slowly- but more to be done. The biggest reason for sticking with organic farming for us is the avoidance of chemicals and routine drug use. We still use far more than I would like (for treating blowfly on the sheep and fluke in the cattle) and we’re looking for ways to avoid/limit this in the future. We have already cut down flukicide hugely just by managing pasture and water cleanliness but the aim is to abolish completely. I’m a strong believer that the health of your environment directly influences your own health and the health of the animals in your care. You are what you eat. It should, therefore, be obvious that you are also what your food eats . . shouldn’t it? And that, if you are organic, this goes without saying . . .
It’s Organic, Jim, but Not as We Know it! When we first arrived here I was massively frustrated by the lack of organic farms in this area – there are a few but they are not abundant and are mostly dairy and, even ours had, for years, been managed by people who believed farming organically was just a way to make more money but with irritating hurdles. There was a mind-set of ‘but we’ve always done it like this’ and suspicion of anything new. The conservation measures put in place by the farm owner were seen by the farm staff as ‘anti-farming’; something to be attempted half-heartedly to tick boxes. And then there was the attitude of the farm vets. We’d only been here two weeks when one of the vet partners came to introduce herself, and spent an hour boasting about how she’d got the measure of the Soil Association, and could get a derogation for anything, any drug that we wanted. I was shocked at first and then furious. This is obviously a much larger problem. It stems from a complete arrogance and lack of understanding from the vets and a total reluctance and/or ignorance of holistic farming methods from farmers/stockmen. Why isn’t this being picked up on? It seems being Organic is not as Organic as should be. And if I have questions about the way food is produced- what hope does the general public have? I intend to find out . . . . watch this space!